The Fletcher class, USS Cowell (DD-547) is a gift Rank III American destroyer with a battle rating of 4.3 (AB/RB/SB). It was first announced in Update 1.77 "Advancing Storm" as a bundle to access the Naval Closed Beta Test. A Fletcher-class destroyer in the United States line, the Cowell is in the same class-line as the family ship Fletcher (DD-445). The first statistical difference between the Fletcher and the Cowell is the armament, with the Cowell having four more turrets of 40 mm Bofors autocannons, and having one more additional turret of 20 mm autocannons. The Cowell is very strong and powerful against smaller vessels, however, should you be able to live long enough, a torpedo hitting the ship basically anywhere will guarantee a kill. Try using islands and cover to your advantage when attacking a Cowell using a plane or PT boat to hide from the arcs of the Bofors. For destroyers, aim underneath the front turret with an AP shell. You will have a chance of detonating the ammunition stowage for the front guns which will normally kill the whole ship. The radar atop the bridge is covered with an antifragmentation armour with 19 mm thickness. Gun shields around the 20 mm Oerlikon autocannons are 12.7 mm thick. As a destroyer, the Cowell stands above the PT boats in the previous ranks. With its fast firing armament, it is definitely capable of fighting other destroyers. Load APHE for your main guns and you can start firing against enemy ships from mid to long range. Try disabling the enemies' engine room or gun turrets to prevent them from escaping or fighting back effectively. You also have ten torpedoes so you can use them in any tricky situation. Should you be outmatched, try turning away and using a smoke screen to conceal yourself. The Cowell has lots of anti-air weaponry. The deadliest will be your ten Bofors and five 127mm cannons. Let your AI gunners shoot from long distance using radio fuse HE shells. Once enemy aircraft come close enough you should either take control of the Bofors or the main guns themselves to deal with enemies. As always, lead your target and take into account your ship's momentum if you need to. The ship can fire all of its anti-aircraft guns when the enemy is directly above the ship. Try turning to the side to allow more guns to fire if the enemy is coming from an angle. The radio-fuse shells will make quick work of any enemy aircraft or at least critically damage them to the point that they will not be able to make their attack run, while the Bofors will chew down many smaller planes. The Bofors also allow the Cowell to hunt PT boats and other small craft very well. From longer distances, use HE or Radio HE shells to try to hit enemy PT boats and deal splash damage to them. Once you move in closer, take command of your Bofors, load their Universal or HE belts, and slice the PT boats to ribbons. 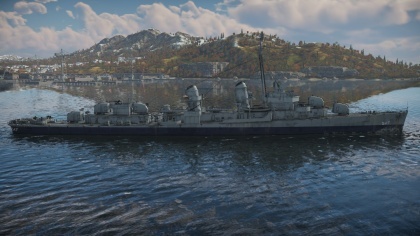 For larger gunboats, using your main guns are still an option. Since you are a destroyer, you are armoured enough to be immune to most of their small cannon and machine gun fire. Your main threat at this point is torpedo boats. Try targetting any PT boats that are heading in your direction. 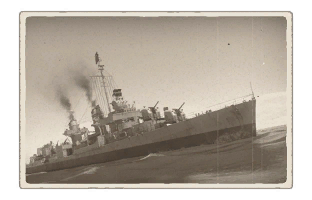 PT boats such as the LS 3 and G-5 are dangerous since they are small, fast and can carry 2 torpedoes. Be sure you make your course erratic and hard to hit, and always be ready to change course in the event that you detect an incoming torpedo. Keep in mind, if a torpedo hits: game over. BTD-1: This plane can carry 2 torpedoes which can kill you very quickly, or can attack you from high altitude with a 2000 lb bomb. Try prioritizing these aircraft to shoot down first. Pr. 159: This patrol ship can shoot very rapidly and deal a lot of damage to your ship. Try engaging it from long range where your shells will have the advantage. Light Cruisers: Light cruisers will have better guns that are capable of beating you in a straight up gun duel. Try avoiding them or disabling their vital parts, or requesting help. Very vulnerable ammunition rack beneath the front turrets. The USS Cowell was laid down on 7 September 1942, completed on 18 March and commissioned into service on 23 August 1943. She was the second ship, specifically, the second destroyer in the U.S. Navy to be named after her namesake, John G. Cowell. The individual after she was named after was an officer on board the U.S. sailing frigate USS Essex, that was severely wounded during a battle against a pair of British ships in the South Atlantic during The War of 1812. Despite losing a leg, Cowell refused to be carried to the lower decks for medical treatment, instead choosing to remain on his station and continue to motivate his fellow crewmen throughout the battle. Several weeks after the battle, Cowell died to his wounds and received an honorary burial for his courage in the principal church of Valparaíso, a rare honour for a foreigner. As for the destroyer USS Cowell, she was mostly employed as a carrier screener and anti-aircraft destroyer early on in her service career and later on as a radar picket. She took part in several major operations in the Pacific theatre, most notably on Okinawa, where she distinguished herself by shooting down several japanese regular and kamikaze aircraft and aiding damaged ships by providing covering fire and assisting in damage control. USS Cowell arrived to her homeport of San Diego on 17 November 1945 and was decommissioned from active service on 22 July 1946. Throughout the postwar period until 1951, Cowell was part of the U.S. Navy reserve. She was recommissioned into active service in September 1951 and participated in the Korean War as well as various exercises in the Pacific, Atlantic and Mediterranean. In August 1971, the ship was ultimately decommissioned from U.S. service and was sold to the Argentinian navy, where she received her new name - Almirante Storni. She served under the Argentinian banner until 1982, when she was finally decommissioned from service for good. Shortly after, she was taken apart for scrap. Skins and camouflages for the USS Cowell from live.warthunder.com. This page was last edited on 11 March 2019, at 04:46.